The ever-increasing ubiquity of smartphones, in both developed and emerging markets, is driving prices for the devices lower and lower, according to technology market-research firm International Data Corp. The average selling price worldwide for smartphones has fallen from $443 just two years ago to $372 this year, according to IDC. The company projects that by 2017, smartphones will sell for an average $307, driven by customers in emerging markets who are gravitating to 3G and older phones; already IDC expects the average selling price of smartphones in India to fall below $200 by the end of this year. IDC last week increased its forecast for worldwide smartphone growth: It now says shipments will top 1 billion units, representing a 40% increase over last year, with China and other emerging markets driving much of the growth. Perhaps not coincidentally, Apple is widely expected to unveil two new iPhones today: an upgraded version of its flagship iPhone 5 and a lower-end version aimed primarily at international markets (where phones typically aren’t subsidized via contracts with service providers). Smartphone handset makers are looking toward emerging markets for growth in no small part because developed countries have quickly become saturated. Fully 56% of Americans now own smartphones, according to a June Pew Research Center report, including about eight-in-ten people in the 18-34 age group. 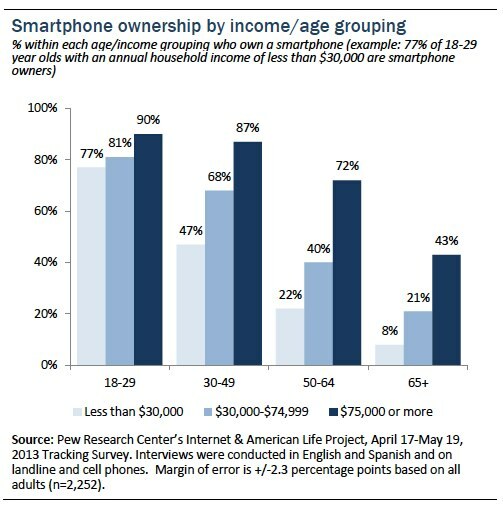 While younger adults are very likely to own smartphones regardless of income level, the Pew Research report found, among older adults smartphone ownership is more of an “elite” phenomenon in the United States: The devices tend to be quite prevalent at the upper end of the income distribution but much less common among those with lower income levels.